I REMEMBER travelling in a Mazda3 when I was a kid, a Mazda 323 actually. The years fail to dull the recollection and with very little effort I can still feel the excitement, the whoosh in the tummy as my aunt put the pedal to the metal. Mazdas were big in South Africa when I was growing up and my mum's youngest sister, so hip and sophisticated to a six-year-old, owned one in a darkish blue with a light brown interior. Aunty dearest had a penchant for speed, still does actually, and even a trip to the corner store could turn into a white-knuckle ride. She would wave nonchalantly to the traffic police hidden under trees with their radar guns, feigning innocence in Oscar-like fashion when pulled over and presented with the evidence of her indiscretion. It was a familiar scene. Her long red finger nails would cover her open mouth in shock, her eyes wide, a little smile starting to form as she tried to explain her way out of another ticket. She was good and hers was the car of choice when my cousins and I had to be ferried around. Of course then, and in Africa mind you, cars built for five often carried a few more. We would squash ourselves into that Mazda, us kids, a couple on the floor a handful more on the back seat sliding gloriously from one side to the other, peals of laughter filling the air as my aunt pushed the car to its limits. What fun it was. 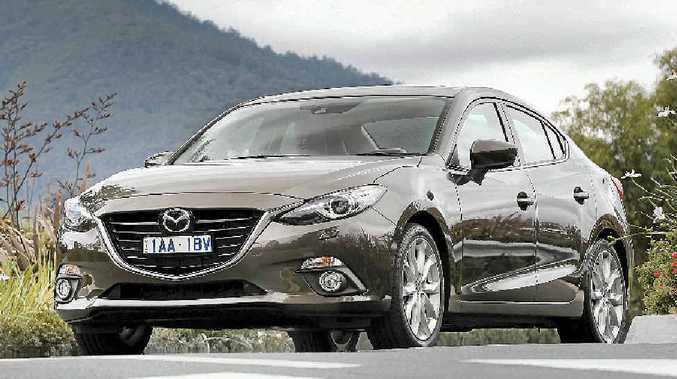 The latest Mazda3 is somewhat different from that early predecessor in looks, style and technology. The Skyactiv system that is such a fundamental part of this model in terms of design, performance and economy is certainly a marvel of modernity. But despite the changes, the Mazda remains the same at heart - a fun drive and the foundation for some beautiful memories. There is a rather noticeable difference to the interior of the '3 with Mazda opting for modern clean lines and materials that give up a much more quality feel than the outgoing model. Most plastics are springy to the touch, the harder not so nice stuff confined to areas not in plain sight. An aeronautically-inspired instrument cluster offers information in an uncluttered manner and looks good to boot with a simple but effective head-up display a nice touch. A new 17.7cm touch-screen - unfortunately not available in the entry-level Neo - is perched on top of the dash instead of integrated within it, perhaps not really the most aesthetic choice but certainly functional. Leather seats are plush and supportive with contrasting stitching adding interest. They are wide in the shoulder too and long enough under the thigh to allow you to feel ensconced rather than just perched on the edge. A longer wheelbase translates into more leg room for passengers in a nicely shaped rear pew although a sloping roofline makes it cosy for anyone approaching180cm. The 2.0-litre engine under the hood of our test car was paired with a capable six-speed auto and proved more than satisfactory. You also have the option of a six-speed manual as well as a SP25 in manual and auto sporting a 2.5-litre engine. The '3 sits firmly on the road, well balanced and poised to perform when needed. The electric steering that replaces the electro-hydraulic version seen in the previous model is better than we expected offering good response and feel. The body of the Mazda 3 is 30% stiffer, designed for better handling and ride comfort. That certainly appears to be the case with a pleasant all-round drive that still has something in it for the true driver. Our test car was quick into corners and competent, showing finesse on the curvy bits and power along the straights. The auto gearbox was smooth only pausing for breath up challenging inclines with the drive somewhat enhanced with the use of the steering mounted paddles. Mazda has stepped up to the plate with the entry-level Neo boasting an inclusions list to be proud of with features like climate and cruise control, tilt and telescopic adjustable steering wheel, keyless entry with push button start and an excellent infotainment system with Bluetooth connectivity. Our Touring model had more of the bells and whistles including 16-inch alloys, dual-zone climate control, leather trim, auto headlights, rain-sensing wipers, sat nav, reverse camera and MZD Connect infotainment system. Safety comes courtesy of a rigid Skyactiv body, six airbags, anti-lock brakes with EBD and brake assist, stability control, traction control, hill launch assist and emergency stop signal. An optional safety pack offers rear view mirror with auto dimming, blind spot monitoring, rear cross traffic alert and smart city brake support. It is big enough for small families, has the nous demanded by empty nesters and its modern infotainment system that allows you to connect with internet radio apps as well as listening to Twitter feeds and texts gives it the technology cred sought by younger buyers. The back seat sits quite low and coupled with a high window line even in car seats the littlies will struggle to see out. Mazda claims fuel of 5.7 litres/100km for the automatic sedan. We were more than a litre dearer during our week but to be honest we were not really trying for economy. Mazda offers fixed-price servicing with their service select program allowing you to pick your intervals according to how many kilometres you do. With its long bonnet, high wheel arches, defined almost upright grille, sleek lines and funky lights, the Mazda3 easily gives the impression of an animal gathering to pounce. It definitely caught the eye of plenty of onlookers during our test week. The Mazda3 was shuffled off its perch last year after dominating the market and did not take kindly to that. It is hoping that this new edition will take it back to the top and early indications are that this car's all-round capability and value-for-money proposition has the strength to do just that. It would be nice to see a diesel though available in competitors like the Volkswagen Golf and Ford Focus, expect that later this year. What we liked: Improved interior, snazzy looks, easy drive, well-priced. What we'd like to see: Rear seat vents, MZD infotainment system as option on entry model, further drop in road noise. Warranty and servicing: Mazda offers a three-year unlimited kilometre warranty with 160,000km fixed-price servicing. Intervals depend on how far you travel (no longer than 12 months), but each service of the 2.0-litre engine alternates between $290 and $316. Details: Four-door small front-wheel drive sedan. Engine: 2.0-litre in-line four-cylinder petrol generating maximum power of 114kW at 6000rpm and peak torque of 200Nm @ 4000rpm. Transmission: Six-speed auto or six speed manual. Consumption: 5.7 litres/100km (combined average).